The estate of Wilson Sharpe. Wilson Sharpe died without a will in late 1900, and the Court appointed Samuel H. Vick and Braswell R. Winstead to assist as commissioners in the handling of his estate. Sharpe’s sole heir was his widow Cherry Sharpe, who was entitled to an immediate portion of his assets for her support. There was not much; she received an old buggy and harness, an old gun, some cart wheels, and pile of old tools. This being insufficient, on 15 January 1901 the commissioners reclaimed property that T.R. Lamm had taken, presumably to settle a debt — a forty-dollar mule, eight hogs, and $25 worth of corn and fodder. In the 1870 census of Taylors township, Wilson County: farm laborer Wilson Sharp,42, and wife Cherry, 27. In the 1880 census of Taylors township, Wilson County: farmer Wilson Sharp, 52; wife Cherry, 45; nephew Jerry Bynum, 6; and James Mitchel, 47, with wife Rosa, 33, and son James G., 11. In the 1910 census of Wilson township, Wilson County: on Tilman’s Road, widowed farm laborer Cherry Sharp, 65, living alone. Finding the Newsomes’ resting place. Searching for Wilson County’s Lost Cemeteries: Project pinpoints gravesites before nature reclaims them. By Drew C. Wilson, Wilson Times, 29 June 2018. Brian Grawburg stops his pickup truck at the end of a farm path between an old hedgerow and a field off Radford Road. “There it is,” Grawburg says, pointing to the underbrush where two flat marble headstones have come into view. The 72-year-old retiree is on a search for hidden and overgrown cemeteries in Wilson County. Grawburg erects a ladder in the bed of his truck, climbs up and points his camera at the graves. He makes a couple of pictures with a 1937 Leica rangefinder and climbs down to note the cemetery’s location with a modern GPS tracker. These are the gravestones of Amos and Martha Newsome, husband and wife, who called Wilson County home in the late 1800s. A neighbor across the road had told Grawburg about the graveyard’s existence, and this was his second visit to the spot. Upon closer inspection, Grawburg notes the presence of another grave a few feet deeper into the woods. Hidden behind a shield of Virginia creeper, smilax and scuppernong grape vines is a marble obelisk not quite waist-high. The face of the monument is clean and the inscription is clear. Despite the difference in the last name spelling, Grawburg wonders if Edna might be Amos’ mother, but he’s not sure. Grawburg says he can’t wait to tell Joan Howell that he has found another headstone. Joan Howell has compiled four books on Wilson County cemeteries. The first one was completed in 1993, and she is currently working on her fifth. All were projects supported by the Wilson County Genealogical Society with information supplied by the group’s members. It is Howell’s work and old Work Progress Administration surveys from the 1930s that offer hints as to where Grawburg may find the forgotten cemeteries. The Wilson resident will sometimes wear boots to protect his shins from snakes and ticks and take along clippers to cut back “vines from hell” as he calls them. Grawburg is building a photographic record of deceased Wilson County residents. He’s not interested in the cemeteries that are neatly kept. Those are the ones that are already well-known. Grawburg is interested in finding the ones that have been overgrown and rest in little patches of woods in farm fields, at the edges of subdivisions, anywhere that Mother Nature has waged a battle to reclaim the plots. “It doesn’t take long,” Grawburg said. A cemetery can go from being well-maintained to overgrown in a matter of a few years. “This is top priority because they are becoming nonexistent,” Howell said. 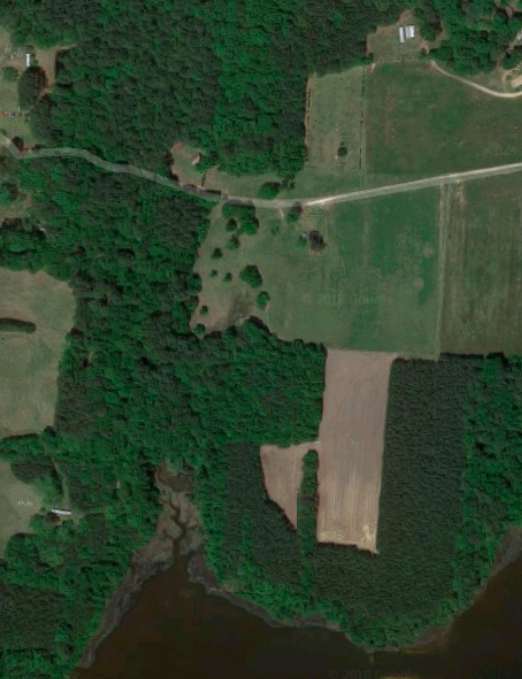 An example is the B. Ellis cemetery in a small plot hidden by trees and overgrowth that is unseen by passing traffic off Forest Hills Road in Wilson. Grawburg said with 16 cemeteries Howell recently found and added to the list, there are about 260 known cemeteries in Wilson County. There are estimates that there could be another couple of hundred cemeteries that are not documented in the county. At age 85 and after two hip replacements, Howell still puts on her “snake boots” and heads into the woods to search. Grawburg and Howell will often meet in the genealogical room of the Wilson County Public Library to share notes. On Thursday, Howell spread out a United States Geological Survey topographical map with handwritten notations marking cemeteries that had been located. “I don’t put anything on the map until I find the cemetery, and then I give it a name,” Howell said. Howell said locating gravestones is vital to filling in Wilson County’s history. Grawburg and Howell said there have been rare instances where farmers have driven implements over cemeteries, knocking over gravestones, and have even taken them away from the actual graves. “That is distressing to me,” Grawburg said. It is also a violation of state law, he added. When Grawburg finds a grave, he wonders who the person was, how he ended up there and what he died from, particularly the children who are interred. Grawburg traveled to upstate New York to locate his own relatives. Grawburg hopes that living Wilson County residents might have the same experience after their ancestors’ graves have been located. He said there is the joy of saving somebody’s heritage regardless of the fact that he is not a relative. Both Grawburg and Howell said tips from the public about the locations of lost cemeteries are valuable in the search. People interested in the project may contact Grawburg by email at archive@myglnc.com. Benjamin Newsome and Edna Newsome registered their 16-year cohabitation in Wilson County in 1866. In the 1870 census of Cross Roads township, Wilson County: farmer Benjamin Newsom, 50; wife Edna, 31; and children Amos, 10, Gray, 18, Pennina, 16, Mary, 13, Louisa, 9, Larry, 7, and Joseph, 5. In the 1880 census of Cross Roads township, Wilson County: farmer Benjamin Newsome, 53; wife Edna, 40; and children Oliver, 21, Amos, 19, Gray, 18, Penelope, 6, and Mary, 2. On 23 December 1883, Amos Newsom, 23, married Martha Ann Barnes, 22, in Wilson County. 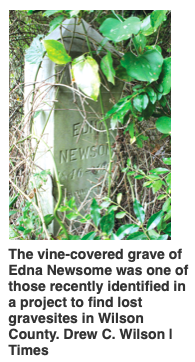 After Benjamin Newsome’s death in 1893, Edna Newsome applied for letters of administration for his estate. A Report of Commissioners valued his personal estate (excluding land) at $400. At his death, he had owned a safe; a bureau and its contents; four beds, [bed]steads and contents; another bed and bedstead; two trunks; a sewing machine; a table; a clock; eight chairs; a stove and contents; two more tables and contents; a lard stand; another safe and contents; a saw; three trays; two jugs; a jar; two pots; a tub; two buckets; one lot of corn (about 15 barrels); two stacks of fodder; two mules; one wagon and gear; one cart; farm tools; a barrel of syrup; two wheels; a loom; four bushels of pears; two bushels of wheat; nine hogs; 150 bushels of potatoes; 150 bushels of cotton seed; seven geese; 25 chickens; 500 pounds of tobacco; and 1200 pounds of seed cotton. On 31 January 1900, Edna Newsome, 55, of Cross Roads, married Ishmael Wilder, 60, of Springhill township, at Newsome’s residence. W.H. Horton, “minister of the Christian denom.,” performed the ceremony in the presence of Grant Farmer, W.T. Barnes, and L.H. Newsome. In the 1900 census of Cross Roads township, Wilson County: Ishmael Wilder, 63; wife Edney, 55; and daughter Clara, 26. In the 1910 census of Cross Roads township, Wilson County: farmer Joseph L. Newsom, 34; wife Virginia L., 34; mother Edna, 65; and sister Mary E., 42. In the 1910 census of Cross Roads township, Wilson County: farmer Amos Newsom, 55; [second] wife Frances, 30; and children Lena, 21, Mamie, 17, Mattie, 14, Linettie, 5, Clevland, 2, Willie, 20, and Albert, 18. Amos Newsom died 8 June 1919 in Cross Roads township, Wilson County. Per his death certificate, he was born in 1859 in Wilson County to Benjamin and Edna Newsom of Wilson County; was married to Francis Newsom; owned his farm; and was buried in the “country.” Informant was Larry Newsome. Image of estate document available at North Carolina Wills and Estates, 1665-1998 [database on-line], http://www.ancestry.com. The last will and testament of George A. Barnes. 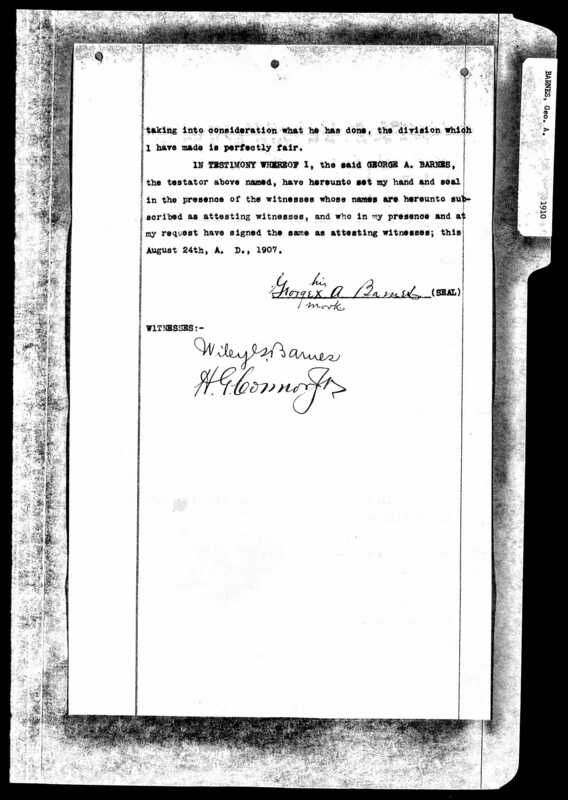 George A. Barnes dictated his will on 24 August 1907. 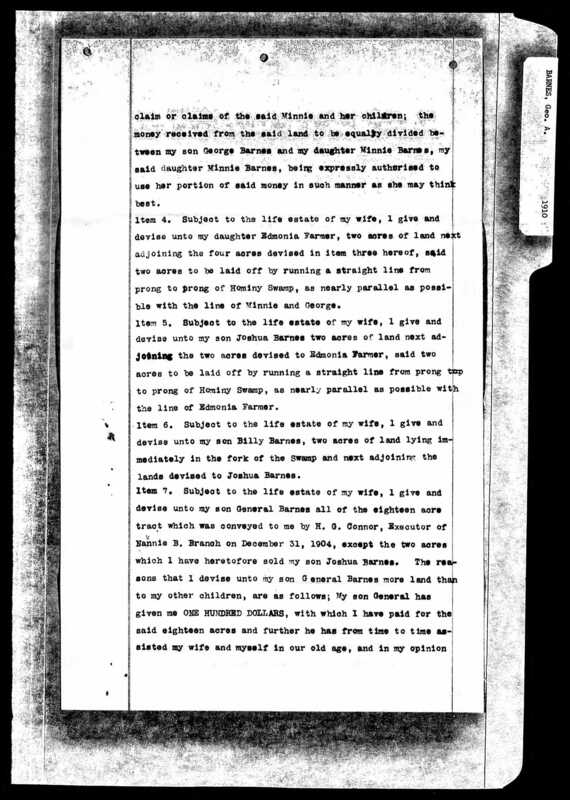 (4) subject to the life estate, two acres to daughter Edmonia Farmer; (5) subject to the life estate, two acres to son Joshua Barnes; (6) subject to the life estate, two acres to son Billy Barnes; (7) subject to the life estate, an 18-acre tract to son General Barnes (minus Joshua’s two acres), which is “perfectly fair” because General furnished one hundred dollars for his father to purchase the land and because General cared for George and Annie in their old age. George A. Barnes died in the spring of 1910, and son George Washington Barnes applied for probate of the will on 11 May 1910. As his widow Annie Barnes held a life estate in all his real property, his estate required minimal handling. However, Annie Barnes died the day after Christmas 1917, and less than a month later their children (and spouses) sold all but two of George A.’s 28 acres for $3000 to A.F. Williams, a white physician (who had treated their mother in her final illness.) The remaining two acres belonged to son Joshua Barnes, who, astonishingly, died exactly one week later of tuberculosis. 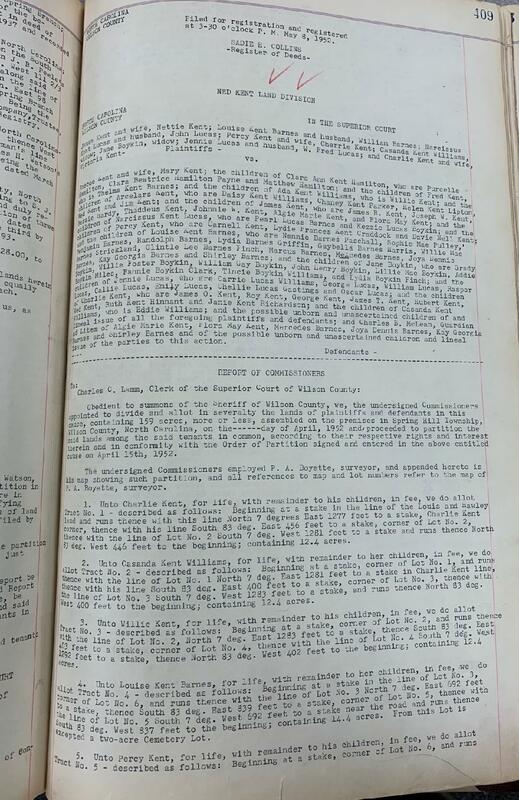 Deed Book __, Page 6-7, Register of Deeds Office, Wilson County Courthouse, Wilson. George Barnes married Anaca Mercer on 31 October 1866 in Wilson County. In the 1870 census of Wilson township, Wilson County: George Barnes, 30; wife Annie, 24; and children Hardy, 8, Rena, 7, Edna, 1, and Jesse, 3. In the 1880 census of Wilson township, Wilson County: south of the Plank Road, farmer George Farmer, 41; wife Anna, 34; and children Hardy, 19, Reny, 17, Jessee, 12, Edmonia, 11, George, 9, Minnie Adeline, 6, Joshua and General, 3, and William, 1 month. In the 1900 census of Wilson township, Wilson County: George A. Barnes, 60, farmer; wife Annie, 53; children George, 23, teacher, Joshaway, 22, farmer, and Jenerl, 22, teacher; grandson Paul, 11; son Harda, 32, and daughter-in-law Nancy, 30. In the 1910 census of Wilson township, Wilson County: on County Line Road, farmer George Barnes, 71; wife Annie, 66; son Joshua, 34; and grandchildren Charlie, 8 , and Hattie Palm, 5. Annie Barnes died 26 December 1917 in Wilson township. Per her death certificate, she was 72 years old; was born in Wilson County to George Battle; and was a widow. George Barnes was informant. Joshua Barnes died 29 January 1918 in Wilson township. 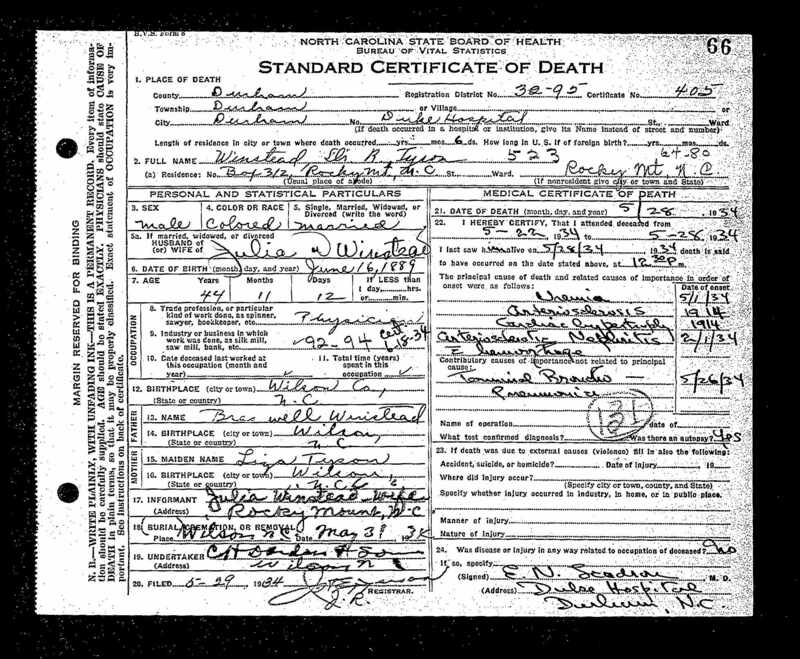 Per his death certificate, he was about 40 years old; was born in Wilson County to George A. Barnes of Wilson County and Annie Battle of Edgecombe County; and died of consumption. George W. Barnes was informant. George Washington Barnes died 13 April 1936 in Wilson. Per his death certificate, he was 65 years old; was born in Wilson County to George A. Barnes of Wilson County and Annie Battle of Edgecombe County; was married to Mary Barnes; and worked as a photographer. General Barnes died 7 January 1938 at his home at 518 North 58th Street, Philadelphia, Pennsylvania. Per his death certificate, he was 62 years old; was married; was born in North Carolina to George Barnes and Annie Battle; and worked as a clerk/postal employee. Mary Barnes was informant. Edmonia Farmer died 18 January 1947 at her home at 706 East Green Street. Per her death certificate, she was 77 years old; was born in Wilson County to George Barnes and Annie Parker; and was married to John Wash Farmer. Informant was George W. Farmer, 1207 Carolina Street. Minnie Baines died 5 December 1963 at Mercy Hospital. Per her death certificate, she was born November 1877 in Wilson County to George Barnes and Annie (last name unknown); was a widow; and resided at 309 North Reid Street. Informant was Hattie Evans, 309 North Reid. The division of Henderson Brantley’s land. Though he died in 1916, Henderson Brantley‘s land in Taylors township was not divided per the terms of his will until 1946. His son Charlie Brantley and daughter Mollie Brantley Howard received equal shares. In the 1850 census of Nash County, North Carolina: Betty Brantley, 50, and her children Kimbrel, 25, Henderson, 14, and Guilford B. Brantley, 12, all described as mulatto. In the 1910 census of Taylor township, Wilson County: on Howards Path, Henderson Brantley, 70, widower; daughter Bettie, 23; and cousin Dock Howard, 38. 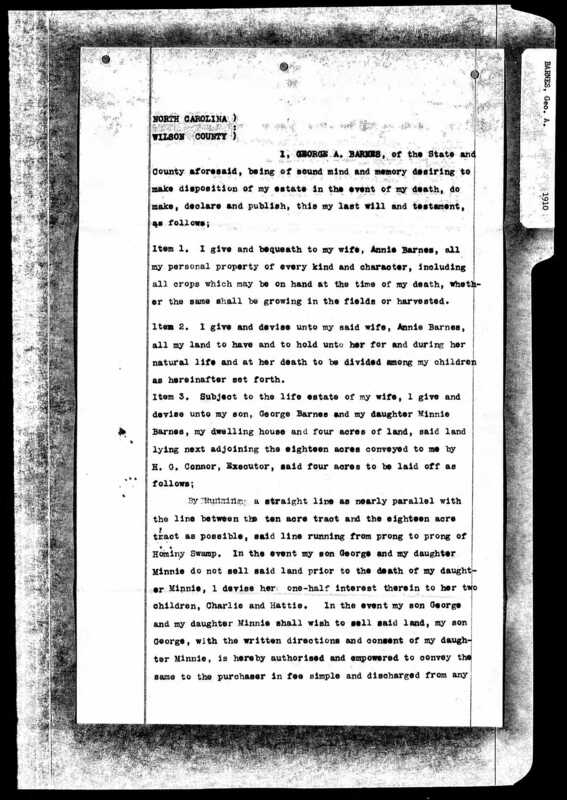 On 9 April 1915, Hence Brantley executed a will in Wilson County. Under its terms, his daughter Bettie was to receive 22 1/2 acres, including the home place; son Charley Brantley was to receive an adjoining 22 1/2 acres; and daughter Molie Hourd was to receive his remaining land. His money was to be split evenly among the children. Brantley named his “trusty friend” Grover T. Lamm executor, and Lamm and Dock Howard were witnesses. Henderson Brantley died 2 December 1916 in Taylor township, Wilson County. Per his death certificate, he was 80 years old; was a widower; was a retired farmer; was born in Nash County to Bettie Brantley. Informant was Charles Brantley. Bettie Brantley died 8 December 1919 in Taylor township, Wilson County. Per her death certificate, she was 40 years old; single; and was born in Wilson County to Henderson Brantley and Mollie Boone. Charlie Brantley was informant. In the 1940 census of Taylor township, Wilson County: Charlie Brankley, 63; his sister Mollie Howard, 53; and lodger Earnest Howard, 30, a farm laborer. Charlie Brantley died 8 January 1948 in Taylor township, Wilson County. Per his death certificate, he was single; was born 1 August 1874 in Nash County to Hence Brantley and Mollie Boone; was a farmer; and was buried in Brantley cemetery. Mollie Brantley was informant. Mollie Howard Brown died 1 January 1974 in Wilson County. Per her death certificate, she was born 15 April 1878 in Wilson County to Henderson Brantley and Mollie Boone; was a widow; and was buried in Howard cemetery. Earnest Howard was informant. 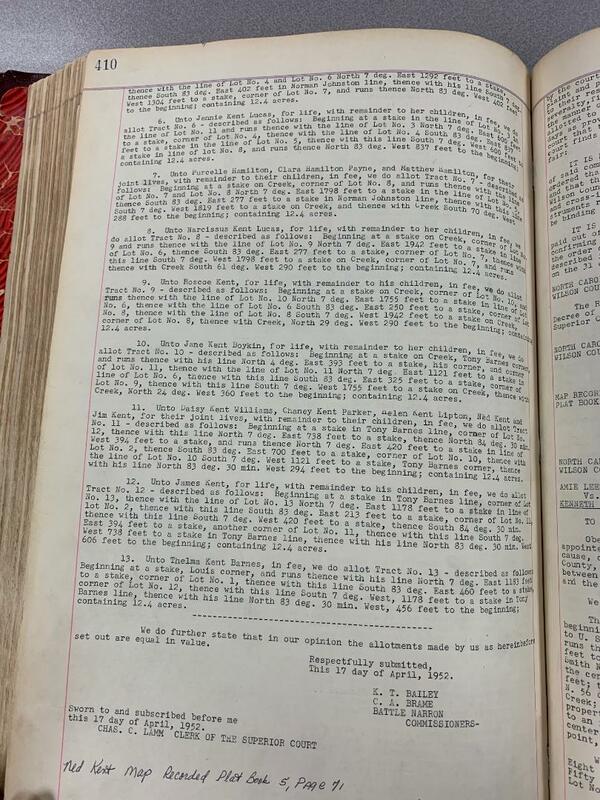 Plat book 2, page 218, Register of Deeds Office, Wilson County Courthouse. The last will and testament of Larry Dew. Dew’s estate entered probate in Wilson County in April 1862. These documents from his estate file, submitted to the court in November 1862, chronicle the calculations behind distribution of his human property. Two and a half years later, the work of Dew’s executor was undone by freedom. 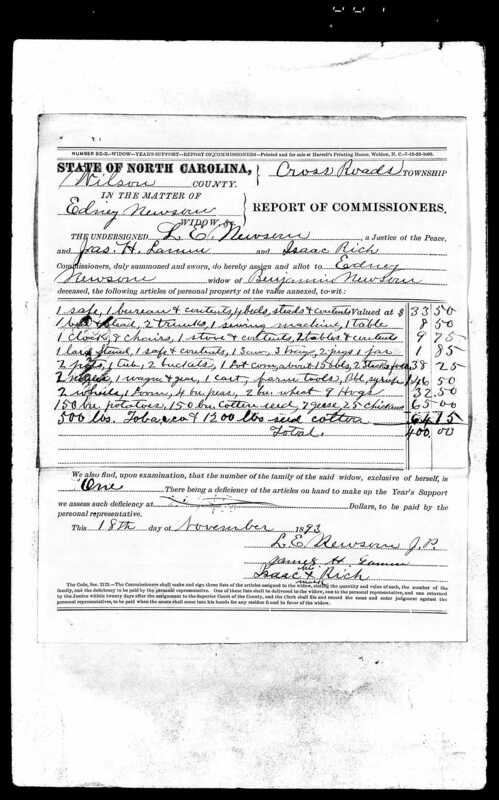 Estate of Larry Dew (1862), Wilson County, North Carolina, Wills and Probate Records, 1665-1998 [database on-line], http://www.ancestry.com.